Every Thursday, your Tremendous Trivia host JD brings you and your friends a challenging and entertaining evening of general knowledge trivia, Name That Tune, laughter, fun, and PRIZES! Who will win the coveted Tremendous Trivia trophy? Registration and warm-up activity are at 8 p.m., and the trivia starts shortly after. It's free to play! This event fills up quickly so get your family and friends together and reserve a table. 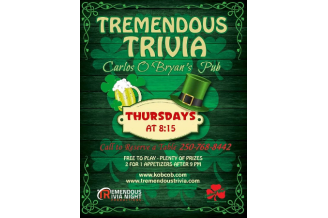 Make Kelly and Carlos O'Bryan's your weekly trivia night destination!